My Plates is bringing back one of the state’s most popular general-issue license plate designs that proudly features the space shuttle, the oil rig and the cowboy. For the first time, Texans will be able to personalize this design. One of Texas' most popular general issue license plates is back! Sooner or later, everything old becomes new again! This appears to be the case as My Plates is bringing back one of the state’s most popular general-issue license plate designs that proudly features the space shuttle and the cowboy. But, there’s a new twist. This iconic Texas general-issue license plate was first introduced in 2000, and 31.5 million sets of these plates were manufactured before a replacement general-issue design was launched in 2009. Now, Texans can adorn their vehicles once again with this classic design, and for the first time, customize it with personalization up to 7 characters, whether up to 7 letters or a mix of alpha-numeric characters! Another slight change for the keen historian or plate collector is that the original design when released as a general-issue plate displayed a horse with only three legs. The new design released by My Plates will feature a four-legged horse. The plate is also now manufactured via modern printing technology, and is no longer stamped like the original issue. Just like the previous general issue design, this plate features a nice mix of old and new. A nod to more modern history with the space shuttle, and the oil derricks, and yet features the timeless Texas stars at night, classic Texas vista and cowboy on a horse. Three main colors are used on the plate, red, white and blue, the patriotic colors of Texas and the U.S.A. Following a unanimous approval by the TxDMV Board at their October meeting, My Plates now needs to reach 200 pre-orders to move the plate to production and final release. Pre-orders for the Texas 2000 plate start from only $50. Five year terms that offer a multi-year discount are also available. My Plates is hoping to reach the 200 pre-orders quickly and schedule the design for release in early 2018. “This iconic Texas license plate has been very popular in recent surveys and we expect that popularity to continue now that it is available to purchase,” said Steve Farrar, President of My Plates. 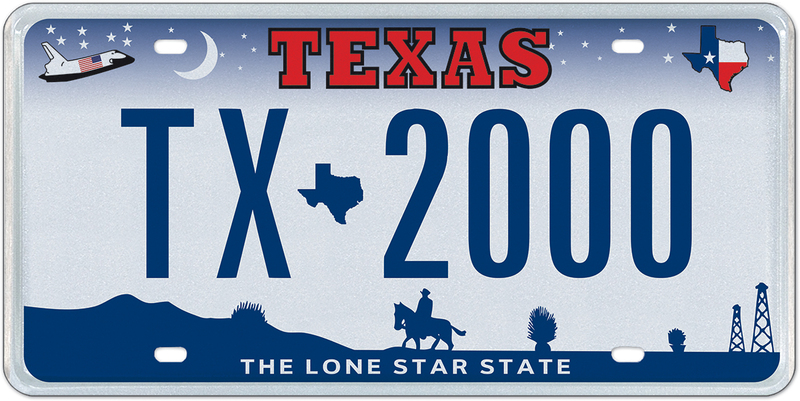 Texans wishing to pre-order the Texas 2000 plate design, with personalization or without, can visit http://www.MyPlates.com or call the My Plates customer service center at 888-769-7528, M-F 8a-5p. My Plates designs and markets new specialty license plates as a vendor for the Texas Department of Motor Vehicles. Texans have bought more than 330,000 My Plates since November 2009, putting more than $58M in the state general revenue fund. My Plates’ goal is to create a long-term, mutually beneficial relationship designed to maximize revenues for the state through the sale of My Plates specialty plates. http://www.myplates.com.